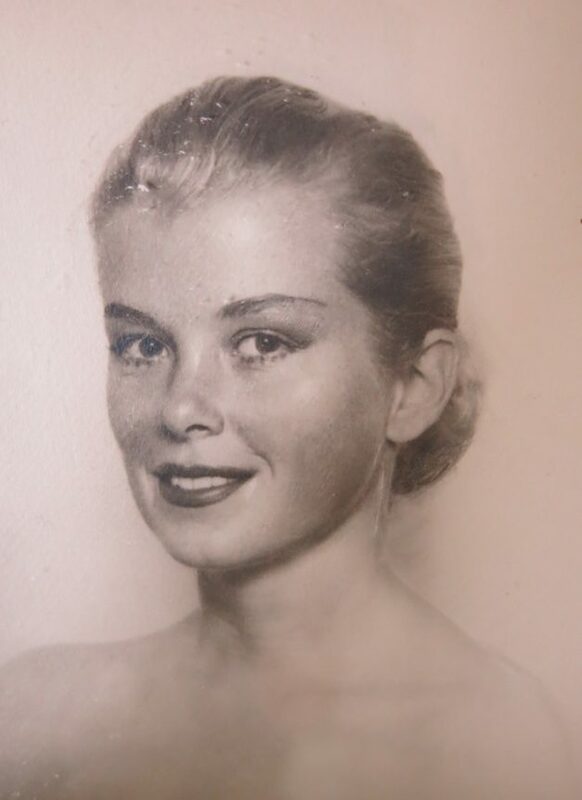 Carlene Joanne Clark Challis was born July 26, 1931, in Los Angeles, to Ruth Marguerite Switzer Clark and Harold Douglas Clark, a cabinet maker and carpenter originally from Canada. The family lived on Peck Road in El Monte during the Great Depression. Her elder brother Vernon enlisted in the army in 1945 at Fort McArthur and served in Germany. Carlene graduated from El Monte High School in 1949 and shortly thereafter the Clarks moved to Corona del Mar where Harold Clark became a home builder. He almost single-handedly constructed over a dozen residences in Laguna Beach during his lifetime. In the early 1950’s, Carlene was employed by the Kay Finch Ceramics studio in Corona del Mar, where she painted and sculpted. She met her future husband, art dealer Richard B. Challis, at a diner near his studio on South Coast Highway in Laguna. They married in 1954. They first lived in a little house at the end of Canyon Acres Drive. Later when she was expecting her second child, her father built a home for them on Temple Hills Drive. Challis was an artist’s model for the innovative photographer William Mortensen, who made several glamorous portraits of her. Her natural beauty was often compared to that of actress Grace Kelly. She was divorced in 1963 and her father once again built a house for her, this time an unusual A-frame structure on Bluebird Canyon Drive that was cantilevered over the canyon creek. There she raised her two children Diane (Dee Dee) and David. Over the years she worked as a receptionist for various venues including the Leisure World Television Studio, a modeling agency, and a picture framing studio. Challis modeled dresses for Lois Paul’s boutique at the Hotel Laguna. She was also a visiting caregiver for local seniors, a seamstress/dressmaker and a licensed manicurist. For over 20 years, she was commissioned to hand-color hundreds of antique lithographs of Egypt and the Holy Land by David Roberts for commercial art dealers on the east coast. In her later years, Challis created all kinds of hand-painted housewares, watercolor botanicals, textiles and birdhouses. They were sold at the California Gift Show in Los Angeles, Rodeo Drive and several gift boutiques in Laguna Beach. She also built, decorated and sold many miniature doll houses. She passed away at her daughter’s home in Laguna Niguel of natural causes at the age of 86 on Sept. 18, 2017. She is survived by her two children Diane Leslie Challis Davy and David Richard Challis and grandson Thomas Stevenson Davy.